To switch applications while VoiceOver is running, you can use the operating system’s built-in application switcher or VoiceOver’s Application Chooser menu. Press the Command and Tab keys at the same time to bring up a list of running applications using the operating system?s built-in application switcher. To move forward through the list of applications, continue to press the Command and Tab keys (pressing Shift, Command, Tab moves back through the list). When the application you want to use is selected, let go of the Command and Tab keys to bring it to the front. Hold down the Control and Option keys and press the F1 key twice. 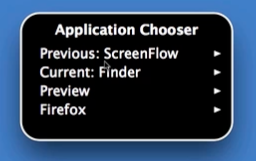 This will bring up the VoiceOver Application Chooser menu. Use the Up and Down arrow keys to navigate the menu. To open a submenu, press the Right arrow key, and to select an option press the Space Bar.